One of the loveliest stage productions of any kind that I have seen in ages, Los Angeles Opera’s Orpheus and Eurydice enlists the talents of three superb vocal soloists, a magnificent orchestra conductor, a magical unseen chorus, and a top-flight ballet company under the direction of a genius choreographer, John Neumeier, who also designed the sets and costumes. 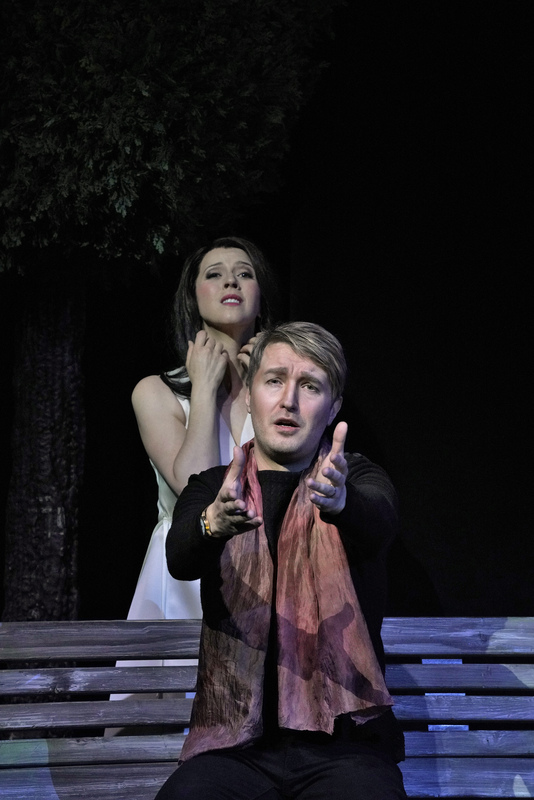 The Orpheus is Maxim Mironov, a bel canto specialist who lives up to that title in every sense of the term. He is a master of a deftly projected, well focused lyric tenor voice. With his slim figure and savvy stage manner, he makes a convincing romantic hero, albeit one who is very contemporary and vulnerable. This is important for Neumeier’s Regietheater concept which brings the Orpheus myth into our modern world. 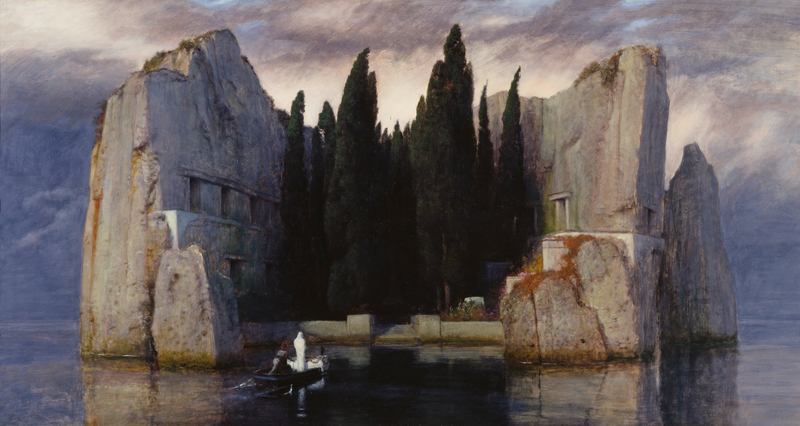 Orpheus is a choreographer of a ballet company which is about to produce a new ballet inspired by the famous Arnold Böcklin painting, The Isle of the Dead, the image of which dominates Neumeier’s brilliant and imaginative ever-shifting stage designs. In Neumeier’s concept, Eurydice is a ballerina in Orpheus’s ballet company. At curtain rise we see that she, after an argument with her husband, is the victim of a fatal automobile accident. Thus begins our hero’s imaginary descent into mythic territory in which he journeys through Hades, charming all the demons there, and ultimately reaching Elysium, the blissful Land of the Dead. 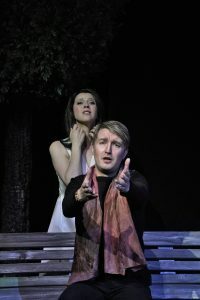 But the return to earth with his rescued bride is plagued by a decree from Jupiter that Orpheus must not look back at Eurydice before reaching topside. Such a glance would be fatal and he could never hope to see Eurydice again. The Accident. Photo by Ken Howard. 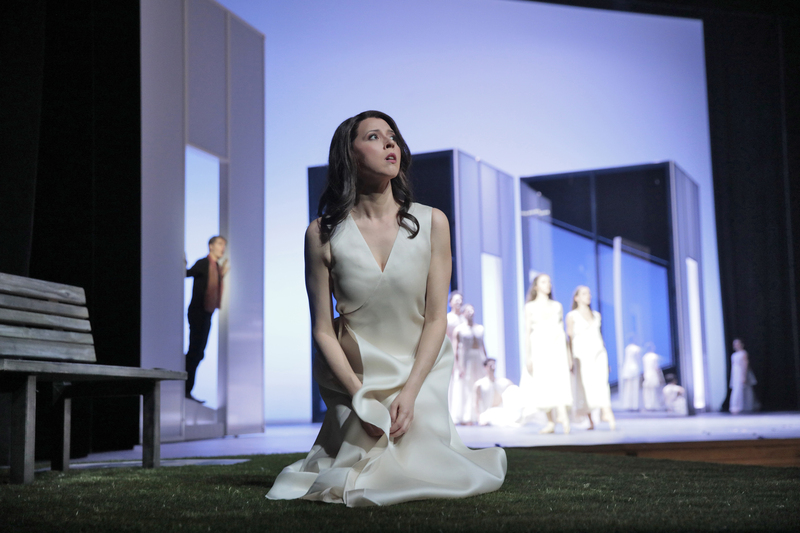 But, after Orpheus’s inevitable suffering and loss, Gluck’s beautiful opera ends happily, somewhat defying the logic of the story. The God of Love, Amour, triumphs over death — at least symbolically here; Eurydice is “reborn” in Orpheus’s Isle of the Dead ballet. Amour is performed with unforgettable delicacy by soprano Liv Redpath. In Neumeier’s version, Amour is a kind of reassuring pal or sidekick, the kind that so many fictional heroes seem to have. Redpath is another artist I would very much like to hear again. Musically, this was a most satisfying performance of what appeared to be the entirety of Gluck’s wonderful Paris 1774 score, not heard nearly enough in live performances. The Dance of the Furies, the Dance of the Blessed Spirits, and the aria, “J’ai perdu mon Eurydice,” crop up here and there on radio or in recitals, but the entire opera, once very popular, has become relatively obscure. I recall Gluck’s name (in the company of Mozart, Verdi and Beethoven) emblazoned on the proscenium arch of the old Metropolitan Opera House. Conductor James Conlon is a superb stylist and his Orpheus was all elegance. With Grant Gershon’s subterranean chorus (under the stage) creating a mysterious atmosphere, everything came together to make a feast of transporting sounds. Mironov won warm applause for the “big aria” of the piece. On recordings Maria Callas sang “J’ai perdu” with great emotion, but the aria is also widely recorded in the original Italian. 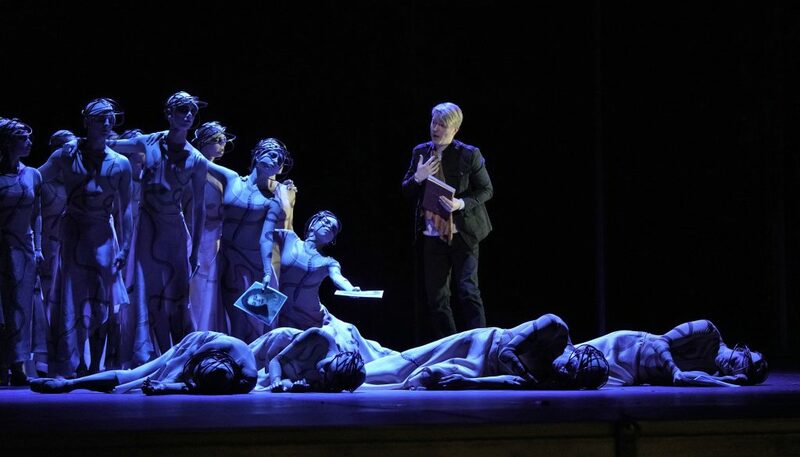 At the Italian premiere, Orfeo was sung by an alto castrato. The role has been sung since then most often by contralto and mezzo-sopranos as a trouser role. Meanwhile, with a few passages of calm, the stage visuals were a continually changing phantasmagoria with almost everything in motion. The choreography was of enormous complexity, almost always contrapuntal and employing pairs, solo dancers, and ensembles, all moving over the vast expanse of the stage. 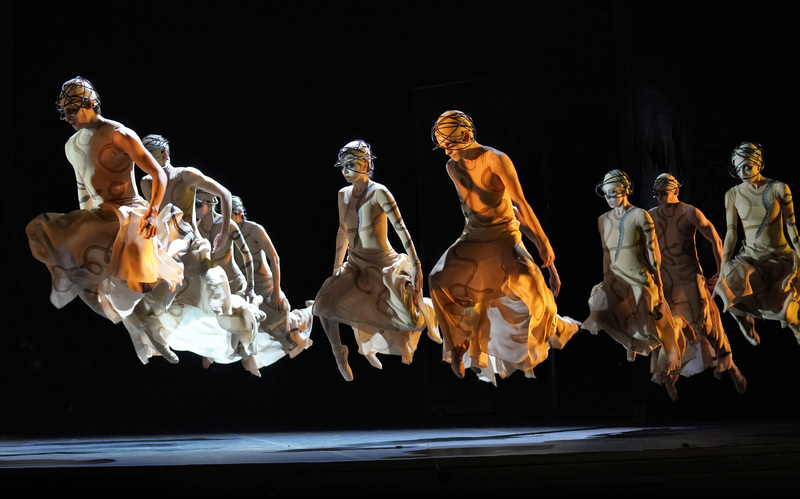 Neumeier also choreographed the singers and the sets themselves which continually amazed in their multiple configurations. The use of mobile modules and mirrors and lighting and projections was stunning to behold. Fortunately I have Ken Howard’s amazing photos here to help explain what is worth the proverbial thousand words. Everything clicked, right down to the costumes and the lighting. 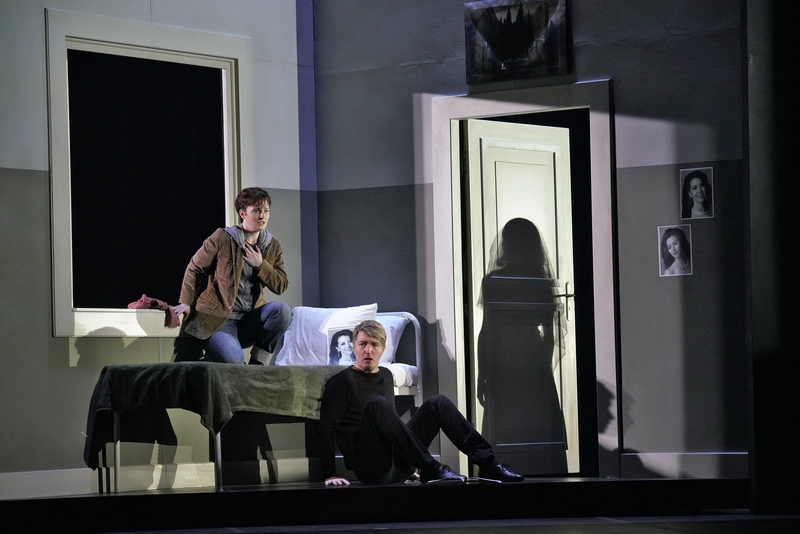 Yes — Neumeier created the lighting as well. Talk about Gesamtkunstwerk! Reminds me of a certain composer at Bayreuth. 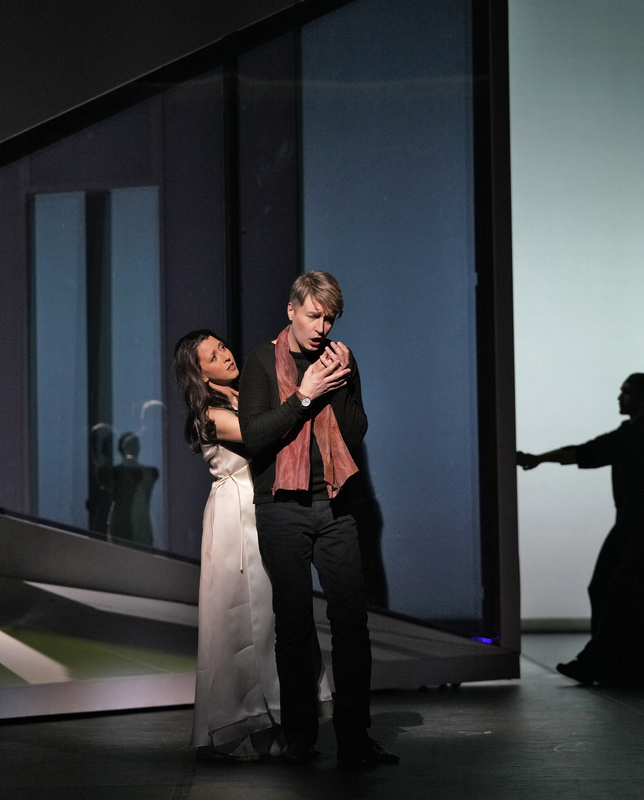 The show is full of poignant moments: Orpheus mourning alone in his modernist cubicle, a shadow of Eurydice floating on the doorway; Eurydice dying for the second time, her body wafted away by ghostly dark figures; a single Fury tamed by the force of Orpheus’s presence. And it all ends in what might be an entire ballet in itself, Orpheus’s splendid creation of the Isle of the Dead. This is one “opera” not to be missed. See LA Opera for tickets and more details. 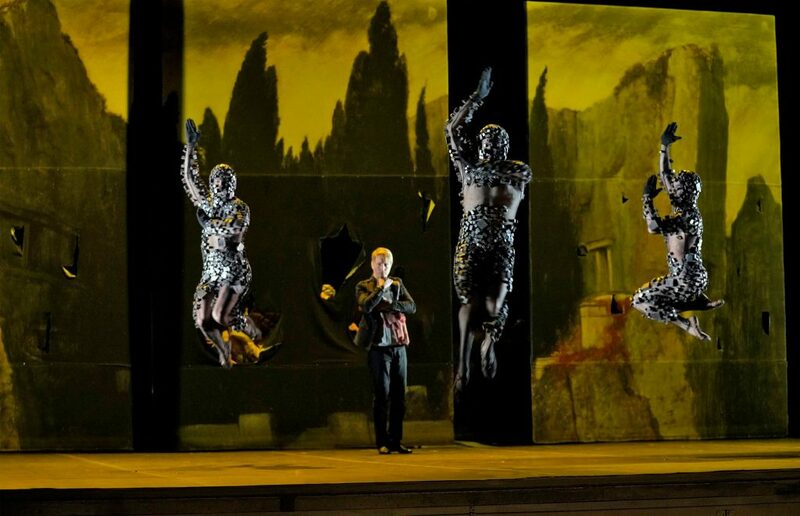 Orpheus Meets the Furies. Photo by Ken Howard.